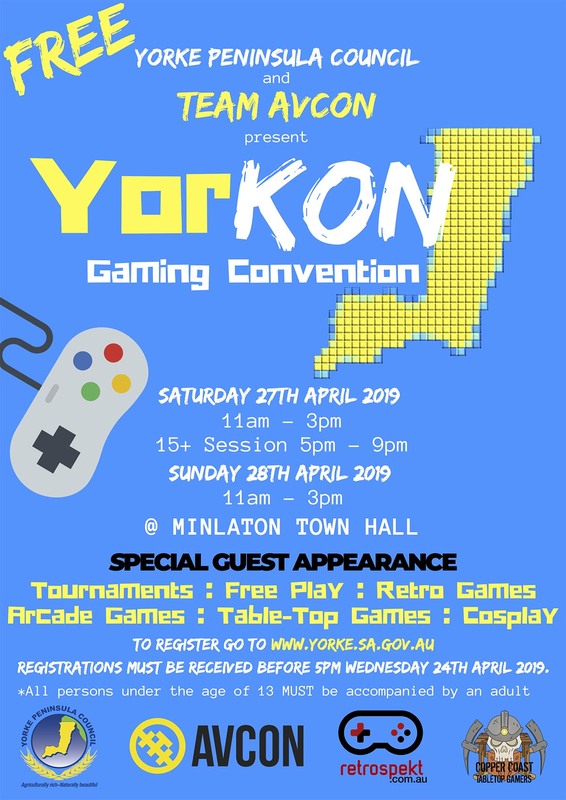 After the success of last year’s inaugural event, Yorke Peninsula Council has again partnered with Team AvCon and the Copper Coast Table Top Gamers, as well as welcoming new partner Retrospekt, in hosting the YorKon Gaming Convention. Not only will this year’s event have more games, activities and a very exiting special guest appearance that will be out of this world, the event will also be run over two days, 27th and 28th April 2019, at the Minlaton Town Hall. The event will run from 11am until 3pm each day with an ages 15+ session to be held on the Saturday evening from 5pm until 9pm. This event provides the local community, especially our young people and their families, with the unique opportunity to engage in a fun and free social gaming event, involving tournaments, free play and retro gaming, table top games and more during the April School holidays. Check out the full details on the Yorke Peninsula Council event page. Follow this link to register for the event. For up to date information, announcements, and news, the Facebook event page will have more reveals leading up to the event. Download a PDF copy of the poster here. The Retrospekt crew look forward to seeing you there!